I just hope that no-one makes fun of Mr Southgate's temporary disability. don't worry button, he is armless. he will have drink left handed now. That's a very cruel thing to say, Mr Dixon. It reminds me of the Pete and Dud unidexter sketch, the likes of which ought to be stamped out! button, don't worry ive been in the same boat. takes about 6 weeks to get back to normal. After all the stereotyping it was nice to get back to the football this evening and what a cracking match it was between Croatia and our long time friends Argentina. In a spirit of unity Lord Sugar has issued this statement "Good to see those bleedin' dagos get it up 'em"
High drama in the politics forum today when Brazil and the Confederation of Helvetia both won in stoppage time and the nig sorry Nigeria beat Iceland. Talking of Ingerland, it was great to see Germany warming up against Sweden yesterday. Looking forward to the second half and another 5 England goals, but it would have made for a better match if the real Panamanian football squad hadn't got mixed up with their all-in wrestling team. Having watched the warm up games and the matches here I have to say that I am actually enjoying watching them which makes quite a change. Gareth Southgate has done a great job in getting a squad together which can cause problems to any of the big name teams. Contrary to expectations Russia has turned out to be a great host nation with supporters from all over saying how they had been made to feel welcome. 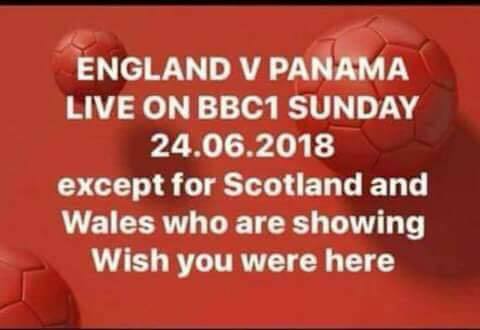 The matches have had a carnival atmosphere with fans from 32 nations dressed up in their teams colours making a lot of noise, hopefully it will continue. Watched the second half of the Japan/Senegal which was end to end and finished in a draw. Without wishing to stereotype anyone the fans from Senegal were very flamboyant and colourful, perfect for our upcoming multicultural event. For the sake of good order I have e mailed Lord Sugar inviting him to open the show. Great drama this evening with late equalisers in both games which left me exhausted switching channels. The supporters from the minor countries Iran and Morocco made the whole thing very watchable. "This may be of interest to someone. A friend of mine has 2 tickets in a corporate box for the next England v Belgium game Thur 28th June. He paid £300 each including flights but he didn't realise when he bought them months ago that it was going to be the same day as his wedding! If you are interested, he is looking for someone to take his place. It's at Nottingham City Registry Office, at 4pm. The bride's name is Nicola -- she's 5'4", about 8 stone, quite pretty, has her own income and is a really good cook. Pm for more details." One thing is for sure we won't lose to Germany on penalties this time. Second World Cup in a row where the holders have gone out early. All is well so far with both teams giving their squad players a chance to shine. Blank day tomorrow but some intriguing matches coming up in the round of the last sixteen. 1-0 to the belguims, engerland has an easier route.